...the first and only mini c-arm with pulsed fluoroscopy. FD Pulse provides dose reduction with state of the art image quality. The square -shaped CMOS flat detector provides the greatest field of view, enabling the user to see more anatomy. This flat detector design and compact form factor allows optimal positioning in the surgical environment. Surgical lights on the undersurface of the x-ray source reduce shadows by providing primary light in the surgical field, illuminating anatomical detail. The Ziehm Solo is the first choice for small operating rooms. 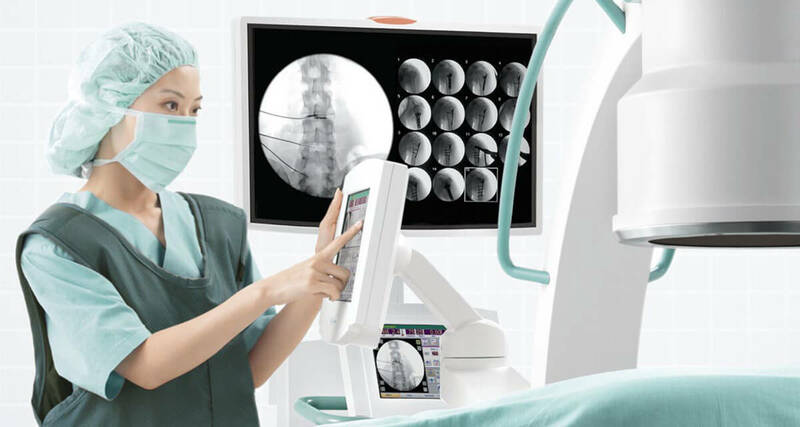 The single unit comprises a compact and versatile C-arm, full size monitor and intuitive touchscreen user interface. All functions required for an optimal image acquisition, processing and archiving are integrated in the C-arm. The Ziehm Solo delivers optimal performance for pain management, orthopedics and lithotripsy. Versatile viewing options such as the separate Ziehm Viewing Station enable the physician to configure the units according to the needs of the application, individual requirements, and local conditions. Single-portal Endoscopic Surgery is a minimally invasive procedure that reduces post-operative pain by avoiding an open incision extending from the wrist across to the palm. Endoscopic surgery is highly effective and has been used for more than 20 years. It results in less post-operative pain, a minimal scar concealed by a wrist crease, and generally allows patients to resume some normal activities in a short period of time. Safe and Effective - "Single-portal endoscopic surgery is a safe and effective method of treating carpal tunnel syndrome." Less Invasive - "Endoscopic carpal tunnel release is a safe and cost-effective technique that, compared to the open carpal tunnel release, improves patient outcome in the first three months following treatment." Low Complication Rate - "...ECTR provides a high rate of success for patients with CTS, with low rates of complication and symptom recurrence." Faster Return to Work - "The improvement in median time of return to work for these patients in the device group was 29 days." 2) Autoclavable Endoscope fits into the SMart Release ECTR handpiece to provide excellent visualization of hand's internal anatomy. 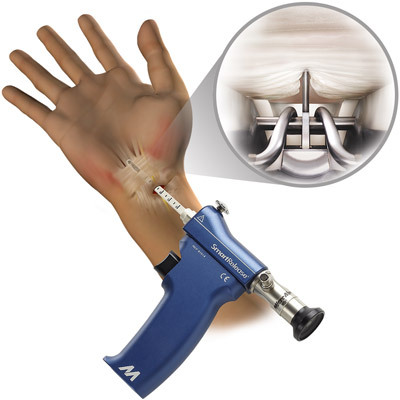 3) Lightweight aluminum, pistol-grip SmartRelease ECTR handpiece with turn-latch on top of the instrument allows blade assembly to be rotated for right - or left-hand surgery. We are centrally located in Albuquerque with rep coverage throughout the state of NM, southwestern Colorado, El Paso and West Texas.